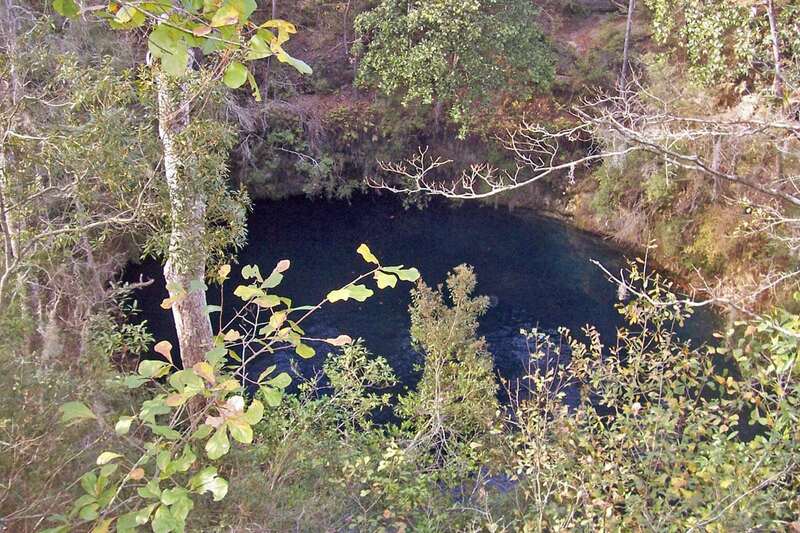 The longest known underwater cave in United States is Wakulla – Leon Sinks cave system. Total length of explored cave passages here is 51,483 m. Between two entrances one should dive more than 11 kilometres and the distance (direct line) between the extreme ends of this cave system is 15.3 km. One of highlights in this cave system is an impressive room – Black Abyss – which is 49 m high. These caves, just as the other karst features of Florida, have formed in Floridan Aquifer. This aquifer consists of water bearing limestones – more permeable than most other limestones elsewhere. In fact this limestone is porous, like a cheese, but with many fissures and tunnels. 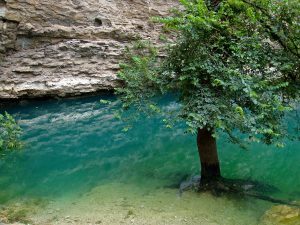 As water is passing through the limestone, the later is dissolved and cave systems are formed. In the upper reaches of these cave systems form sinkholes but in the lower reaches – powerful springs, which often discharge already under the sea level. Wakulla – Leon Sinks cave system has formed in Woodville Karst Plain – a region around Tallahassee and south from the city. This plain is very rich with sinkholes, submerged caves and powerful springs. Limestone here was deposited in mid-Cretaceous – late Oligocene times. Now the land here is located just few metres above the sea level. Caves though go 106.7 m deep – far below the sea level. This is explained by the much lower sea level in ice age – caves for most part were formed then. 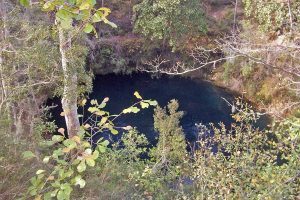 5 – 10 km northwest from from Wakulla Spring in the forest are found numerous sinkholes called Leon Sinks. Part of these sinkholes is located in Leon County, part – in Wakulla County. Some are enormous (Big Dismal is some 60 m deep), some smaller, some have small lakes at bottoms and some are dry. Big Dismal – wet sinkhole (with lake in it). This sinkhole is 30 m deep up to the water level and another 30 m deep below the water level. At 25 m depth is located entrance in cave system. Located at 30.315803 N 84.351568 W.
Black Gum – wet sinkhole. Located at 30.302703 N 84.352514 W.
Gator Sink – wet sinkhole. Located at 30.301025 N 84.351580 W.
Gopher Hole – dry sinkhole. Located at 30.308808 N 84.347690 W.
Gremlin Sink – wet sinkhole. Located at 30.301660 N 84.352945 W.
Hammock – wet sinkhole. Located at 30.314537 N 84.347152 W.
Turner Sink – wet sinkhole. Located at 30.265105 N 84.341432 W.
In the cave system live numerous animals, including ones, which are endemic. One is Woodville Karst cave crayfish (Procambarus orcinus), which is not met outside Woodville Karst. This small crustacean lives in the silt of sinkholes and caves and its existance might be very endangered by the decreasing water quality. Another endemic crustacean is the swimming Florida cave isopod (Remasellus parvus). The courage and persistance of the explorers of Woodville Karst Plain caves is admirable. The exploration of these underwater caves has been technically extremely demanding and, unfortunately, has claimed many lives. Research of the Wakulla cave system started in 1955, when 355 m long passages were explored. Since then several expeditions have been organized and the underwater caves were explored step by step. This research always has been very dangerous and requires excellent organisation of research itself and safety measures. Culmination of this research took place in July 28 2007. Two experienced cave divers of Global Underwater Explorer’s Woodwille Karst Plain Project – Jarrod Jablonski and Casey McKinlay – entered Turner Sink in the Leon Sinks and after 20 hours came out in Wakulla Springs. Dive itself took 6.5 hours, 14 hours were necessary for decompression after diving 90 m deep. There was no possibility to come to the surface in between – thus this was truly astounding accomplishment with very complex support system. Thus there were connected several large cave systems and the largest underwater cave system in United States was discovered. Since then researchers have managed to extend the knowledge and now the known total length of passages is fantastic: 51,483 m! By far not all is explored yet. Not too far is Chip’s Hole – more than 5 km long cave system and several more cave systems. The Woodwille Karst Plain Project by Global Underwater Explorers. Accessed on July 17, 2011. 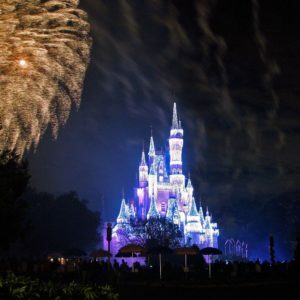 Florida is the tropical paradise of mainland United States. Over the last century it has experienced fabulous changes, turning from forgotten, swampy badland into densely populated and rich land. Highlights of Florida include architecture of the late 19th and 20th century as well as its giant springs and caves. This category includes natural sites where water, other liquids and/or gases reach the surface of the Earth, including locations under water. Powerful natural freshwater springs belong to the most fascinating monuments of nature. Even more exciting is the diversity of unusual springs – mineral springs, hot springs, submarine springs as well as the unusual black smokers. Especially beautiful are such natural rarities as travertine, silica or salt terraces created by warm and hot springs and, especially, geysers. Highlighting the finest cold springs in the state, Touring the Springs of Florida features full-color photos and in-depth descriptions for each of the springs and surrounding areas. Detailed maps, GPS coordinates, and thorough driving directions lead you every step of the way. Whether you’re tubing, swimming, snorkeling, paddling, hiking, diving, or simply sightseeing, there’s a spring for you. The many springs that jewel the landscape of Florida are translucent openings into a dominion very rare: a crystalline world of fresh water at the edge of the sea. The deepest and largest known springs in the world are found in Florida. This book is a guided tour of these beautiful environments, with an emphasis on the many strange and wonderful natural inhabitants.